Our Chief Research Adviser, Professor Peter Horton FRS, is one of the authors behind a new study in Nature Plants that maps out the environmental cost of a loaf of bread. Here, he explains how we can mitigate the environmental damage caused by one of our staple foods. 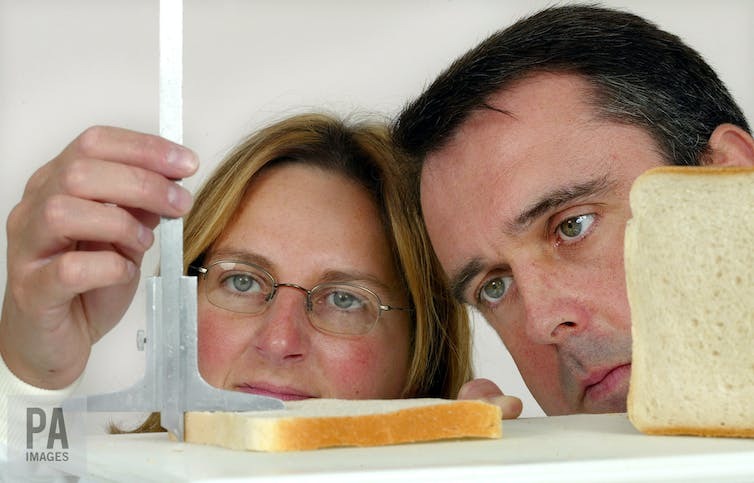 Read the original story: How to reduce the environmental impact of a loaf of bread? What does a staple food such as bread have to do with global warming? For a start, to make loaves on an industrial scale, you’ll need powerful milling and kneading machines and a huge oven, heated to 230? or more. This uses a lot of energy. The flour, yeast and salt must also be shipped in and, finally, the finished loaves are delivered to stores – all in trucks powered by petrol. But it isn’t milling or baking or transport that accounts for most of the environmental impact of bread. In a new a study published in the journal Nature Plants, colleagues and I looked at the entire supply chain of a regular loaf – from seed to sandwich, via mill and bakery. We found that more than half its environmental impact arises not from food processing but from the production of the raw material, the wheat grain. Food causes about a third of total greenhouse gas emissions. Yet the supply chains can be so complex that it is difficult to determine what part of the process is responsible – and without this information neither the industry nor consumers will know what to do about it. This is why it’s useful to take a zoomed-out look at the entire process. Thanks to a collaboration with a bread manufacturer we had accurate “primary” data for every stage of their particular brand of 800g loaf. We found that ammonium nitrate fertiliser alone accounts for 43% of all the greenhouse gas emissions, dwarfing all other processes in the supply chain including baking and milling. 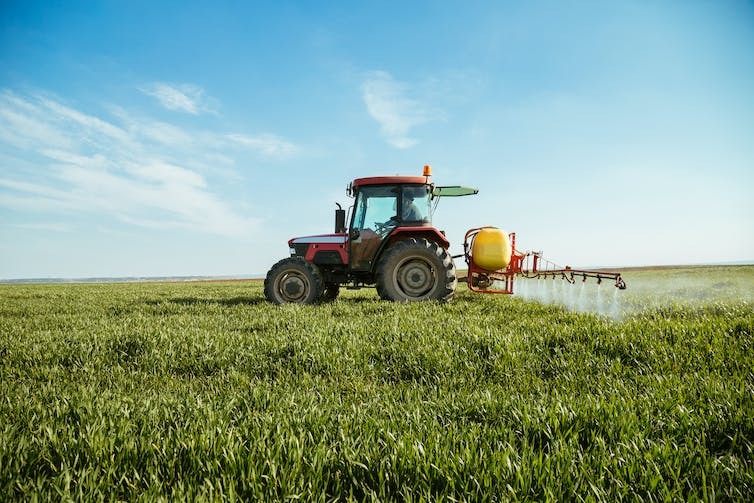 These emissions arise from the large amounts of energy and natural gas needed to produce fertiliser, and from the nitrous oxide released when it is degraded in the soil. For crops to grow big and fast, they need nitrogen, usually through fertiliser. It is the key ingredient of intensive agriculture. Without fertiliser, either we produce less food or we use much more land to produce the same amount, at greater economic and environmental cost. That is the fix we are in. We could reduce the use of fertiliser by recycling agricultural and human waste as manure, in order to retain the nitrogen in the same cycle. We could also harness the best of organic farming by, for example, using “green manures” or rotating crops with legumes that “fix” nitrogen in the soil. Precision agriculture can be used to only apply fertiliser where and when it is needed, using new sensor technologies including drones to monitor the nutritional status of soils and plants. And we can even develop new varieties of crops that are able to use nitrogen more efficiently by, for instance, harnessing fungi in the soil or getting soil microbes to release less nitrous oxide. But technology isn’t the only solution – we could also change our diets. Meat, in particular, is a very inefficient use of nitrogen, as cows or chickens use up energy and nutrients simply staying alive before being slaughtered. Cereal crops such as wheat are a much more efficient way of converting nitrogenous fertiliser into nitrogen in food protein. Studies show emphatically that low-meat diets are also good for the environment. But whose responsibility is it to reduce fertiliser use? After all, fingers could be pointed at the fertiliser manufacturer, the farmer, or even the retailers and consumers who demand cheap bread. With goods like electronics or car tyres there is a growing recognition for a notion of extended producer responsibility where manufacturers are held responsible for the continuing impact of their products, often including disposal. This could be extended to fertilisers too. Consumers could pay more for “greener bread” or apply pressure to use less fertiliser. But things can be confusing as people are usually entirely unaware of the environmental impacts embodied in the products they consume. This is particularly the case for food, where the mains concerns are over human health or animal welfare – not emissions. Many will be surprised that wheat cultivation has a greater environmental impact than baking or milling. This highlights one of the key conflicts in the food security challenge. The agriculture industry’s primary purpose is to make money, not to provide sustainable food for the whole world. Profits for farmers and retailers rely on highly productive crops – which require lots of relatively cheap fertiliser. However the environmental impact of this fertiliser is not costed within the system and so there are currently no real incentives to fix things. Feeding seven billion people fairly and sustainably is therefore not only a question of technology but also one of political economy. We need incentives to use less fertiliser – and we could start with bread. Older How to reduce the environmental impact of a loaf of bread?